“Spook” is a son of late Grays Starlight, one of the all time leading sires of cutting, reining, and working cow horses, sire earners of over $8,260,000! “Spook’s” mother is the great Nu Bar Daughter, Nu Rendition, who is also the mother of the world champion Nu Cash. 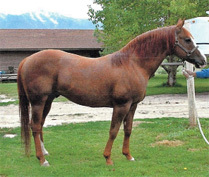 “Spook’s” half brother Nu Cash won over $100,000 and is himself, a leading sire of earners over $1,600,000 in cutting, reining, and working cow horse as well as siring numerous world champion rope horses. “Spook” was unshown due to an injury he sustained as a weanling when three vertebrae in his withers were crushed, causing permanent nerve damage. With maturity he has been able to overcome this injury and was campaigned for the first time in 2003 at National Cutting Horse events. He was very successful. “Spook” has earned $3,122 in NCHA money, qualified for the Western National Championships twice, and was awarded the NCHA’s Certificate of Ability with very limited showing. Spook Charmer has already produced an NCHA money earner and has more foals headed to the show pen in 2006. “Spook” offers incredible bloodlines, athletic ability, beautiful condirmation, brains, and a “can do attitude”.